Review by Nathan on 10/1/2015. Geographically, however, the map leaves a lot to be desired. Americans will immediately notice most states that are out of place, are improperly sized and/or should not connect, for example Illinois is where Oklahoma should be and S. Dakota should not border Nevada. I'm not an expert on Russia, but Irkutsk should not border the Ukraine. Europe is pretty good, but Hessen and Baden-Wurttemberg should be switched. Get these things cleaned up and the map will review much more favorably. ty! i will try to fix the connection and of course the location. Review by OxTheAutist on 10/1/2015. While the bonuses are consistent, they simply aren't logical from a strategic standpoint. Bonuses with a 1:1 territory ratio tend to not be very strategic at all. This can however be overlooked, as I can potentially see some good FFAs on this map. The main problem lies with its geography. The bonuses, territory names, and territory shapes look like they have all been made by different people. If you are having trouble with the names of regions, or if the territories are too big for them, then just name it after cities! Review by [NL] Lucas on 10/2/2015. Review by Riveath on 10/1/2015. It's a fine map, but you placed Poland in Belarus and gave Poland to Germany instead. Review by Nova on 10/5/2015. Review by FunnyEric on 10/24/2015. 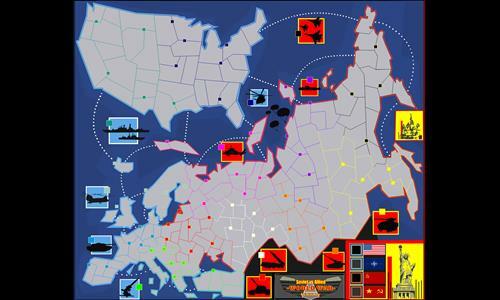 wrong naming of territories (compared to real world) and wrong position of the iron curtain. in particular, the soviet union didn't include poland, slovakia etc. that's pity because the idea is nice.